With all the talk these days about Pinterest, Instagram, Facebook and Twitter, should you invest in LinkedIn? Can it actually help you in your business? Yes, says Anne Pryor, a "LinkedIn online brand trainer, and portfolio career speaker" whose motto is "Look great, be found, get known, make meaningful connections." We first met Pryor when we were working on the first edition of our LinkedIn book six years ago. We learned fast that many people claim to be social media experts, but Pryor is the real deal. You'll see why as you read on. She even tells us one of her clients has generated more than $1.5 million after working with her and following her advice. She, herself, generates three new pieces of "paid business" daily through her use of LinkedIn. This will help you create meaningful connections, search for other business owners or online sellers, learn about news that affects your business, and more. But to really harness the power of LinkedIn, you need to be active. Pryor suggests joining groups and discussions, and commenting and sharing posts you see on the site. Not surprisingly, keywords matter here, too. Just like they'll help busy shoppers find your products, they will help LinkedIn users discover your business. Pryor recommends creating a list of the top 50 keywords that prospects, buyers, or stakeholders can use you found you. Then sprinkle those throughout your profile. It is just like the grandkids sending thank you notes. If they send a thank you, then they will continue to get more. It's also important to know who your top refers are (the people who refer the most business to you), she notes. "These people care about you, know you, trust you and love you," Pryor says. "They think the world of you, understand what you do and have always been there to help you." Pryor suggests knowing the top 33 people who have referred you the most business—a concept she learned about from Dean DeLisle, a sales training expert in the Chicago area. But don't stop there. Thank them, she tells us. Where did she learn that one? From dear ol' Mom. "If you do, they will continue to be a great friend and referrer," she notes. "[Mom says] it is just like the grandkids sending thank you notes. If they send a thank you, then they will continue to get more." As you build your brand on LinkedIn, Pryor suggests using the site's publishing platform to post meaningful content that has a long shelf life and will help you stand out as an authority in your niche. "These blogs appear very high in Internet searches, and portray you as an expert," she explains. "Share success stories and add value." 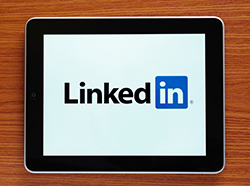 With all of these tips, you may be wondering just how much time you need to spend on LinkedIn. Our expert invests just 10 minutes a day at 7 a.m., Monday through Friday. She says she gets three pieces of paid business with that. On Sundays at 3:30 p.m., Pryor "changes her oil." She considers LinkedIn "a flashing digital billboard" and she changes her profile every weekend to come up higher in searches and on different searches. She's been doing this for eight years with a lot of success.